Positive reinforcement is also called reward, and refers to the positive consequence of a behavior, which increases its likelihood of recurring. For example, employees are paid to do their job and performers who perform well are applauded. Negative reinforcement, to be distinguished from punishment, involves the removal of a negative condition as a consequence of the targeted behavior. If you lose weight by dieting, that is negative reinforcement. In the 1980s, a man with a saxophone and a small kitten on his shoulder frequented the New York City subways. He would play a harsh note on the saxophone as loudly as possible and offer to stop only if the passengers gave him money. This man was utilizing the principles of negative reinforcement (though it might also be called blackmail). 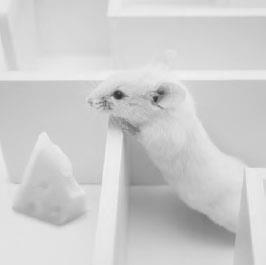 One example of positive reinforcement is a mouse receiving cheese for successfully navigating a maze (iStock).